Memories are part of life. Today, in this 21st century, everyone has busy schedule and you also have to attend functions every now and then. While attending events, you capture lots of Photos with your smartphone. While choosing favorites from those large number of photos captured we forget that when, where and by whom the photos was clicked. So to help you out with this problem permanently, Auto Stamper for Photos has been designed and is up for you. Capture Happy Moments of Life by adding a Stamps on it. Auto Stamper for Photo is a photography Application using which you can make your Golden Moments Immortal. 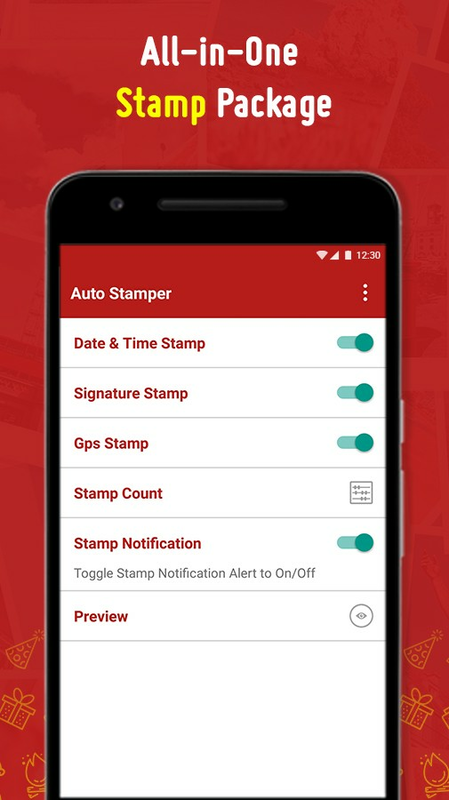 With Auto Stamper you can add up to 3 Stamps named Date and Time Stamp, Signature Stamp and Global Positioning System (GPS) Stamp which no other Application has provided yet. Then depending upon your requirements, you can select any stamps as per your choice. 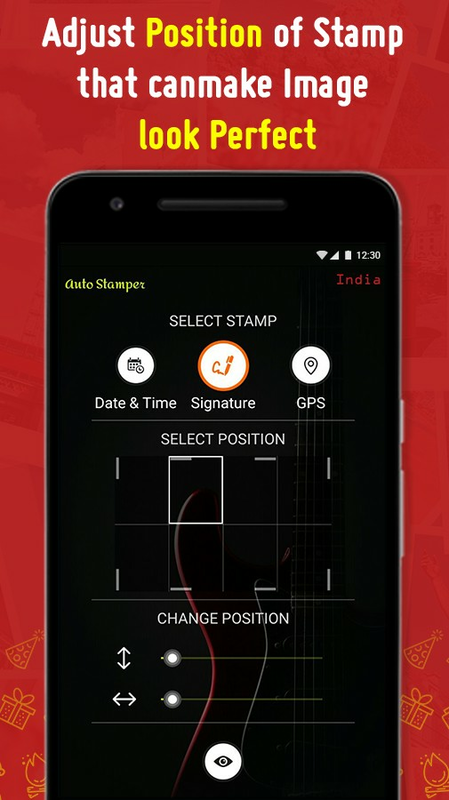 No need to open up the Application to click and stamp images instead use your Smartphone's inbuilt Camera with all its functionalities. You can adjust the date, time and SIGNATURE Stamp formats from wide range of options available. 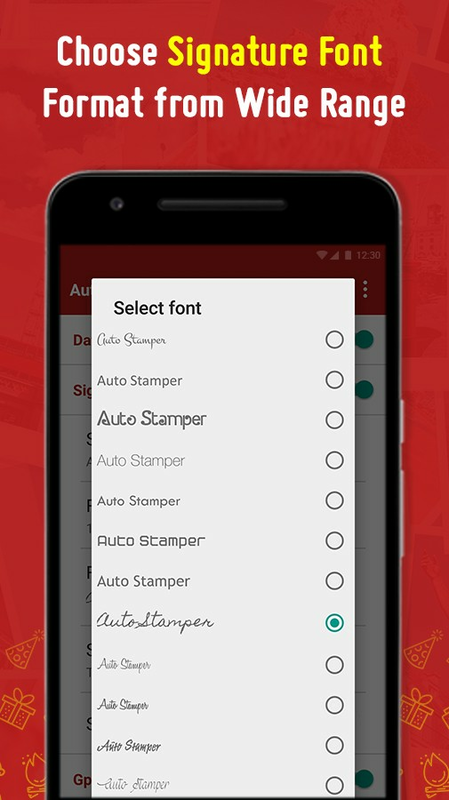 Choose different Font formats for all stamps as you want to display in your Image. 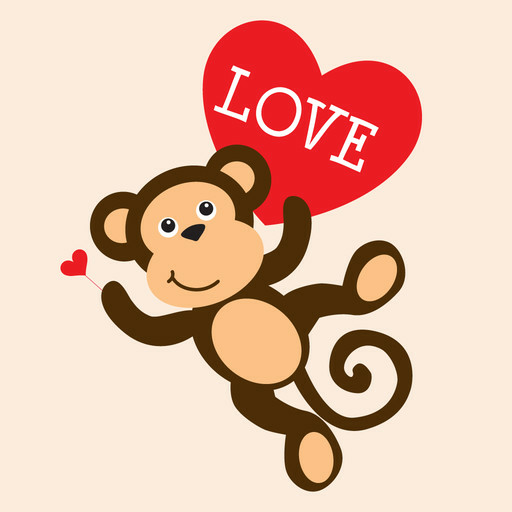 Select the position of stamp as Top left, Top right, Bottom left and Bottom right horizontally as well as vertically that you want on your Picture. 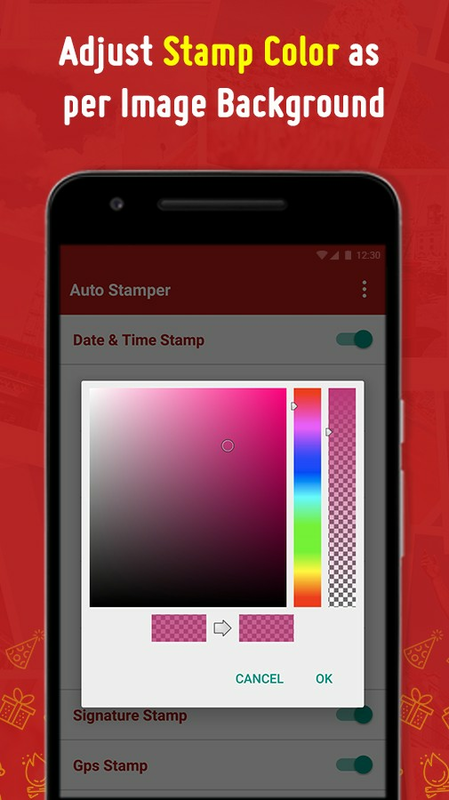 In accordance to the Background of the image, you can choose Custom Color for Stamp. 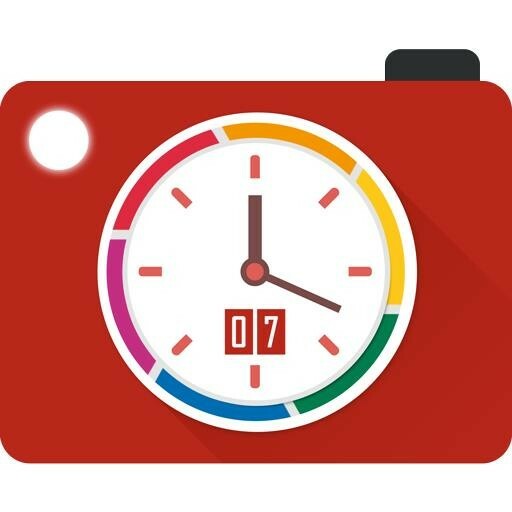 Set Date and Time, Signature and GPS Stamp on the Photos you want with the help of "Toggle On/Off" Functionality. While viewing Photos in a Particular Album, Every time you face situation like you want to know the “Date and Time” on which a particular photo was snapped and you start pressuring your Brain. But now don't worry because with the help of "Auto Date Time Stamp", your Pictures will always be stamped with Date and Time. Do you want your Photos to be watermarked with your own Personalized Signature Stamp? Then with Signature Stamp, you can easily add your Default Signature to any Images that’s been snapped by you. This will help you Protect your Photos from any kind of misuse by others. From your end, you just need to do a one-time setup and then your Signature Text will be automatically watermarked wherever you want on your Image. With GPS Stamp, you can add your Current Location as address Stamp on your Images in Custom Format as per your Likings. 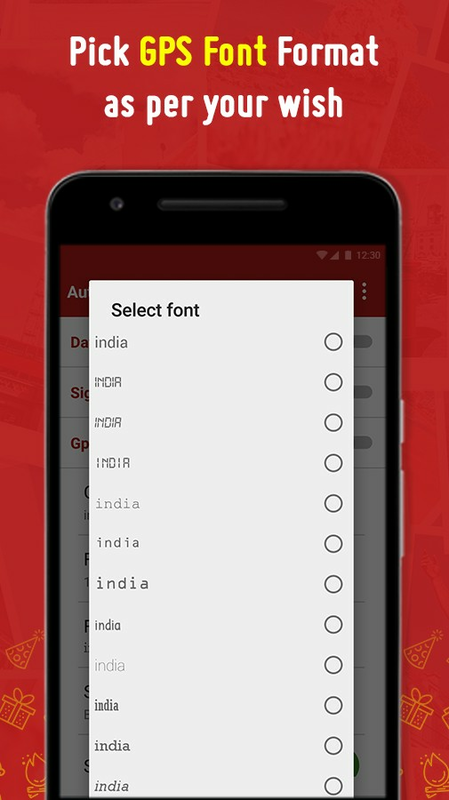 You can choose and display Stamp in any one of the GPS Formats from “Custom Location Text, Latitude or Longitude or Manual Selection from Area | State | City | Country “. GPS Stamp can be extremely useful if you have an auspicious occasion at some Exotic location which you want to mark as a Remembrance on your Photos. You just need to ON GPS system from your Mobile phone and auto stamper will work as GPS camera for you. In other Applications, you need to open up App and then click Images through their Inbuilt Camera. 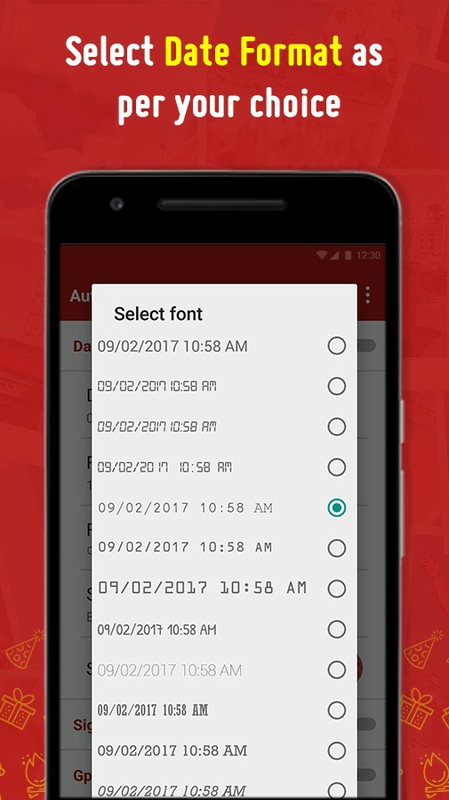 But this Application is completely different from all the others available. 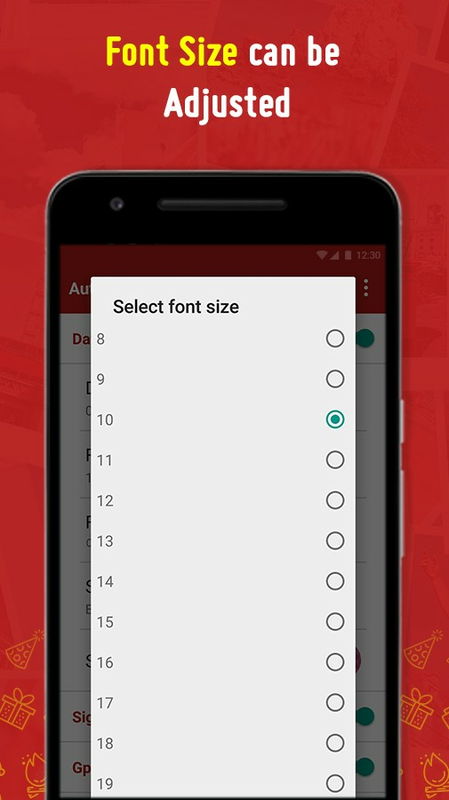 You don’t need to do any Fancy stuff, instead what you need to do is just install this Application and set Stamp preferences according to your convenience. That’s it!